NEW BRITAIN - The Central Connecticut State men’s basketball team’s non-conference schedule for the upcoming season is certainly set up to an interesting one. The 13-game slate includes opponents from the America East, ACC, Big East, MEAC, Ohio Valley, Pac-12 and West Coast conferences the school announced Tuesday. Among those opponents will be Patrick Ewing-led Georgetown, Providence, Virginia Tech, and Oregon State. The Blue Devils are so slated to appear in the Jersey Mike's Jamaica Classic. Marshall is 20-41 over his first two seasons as the program’s head coach, including 14-18 in 2017, an eight-win improvement for the year before. The Blue Devils will begin the regular season Nov. 6 against Hartford at Chase Arena. It will be the fourth straight year CCSU and the Hawks will play in the season opener. Hartford won 85-84 in overtime in 2017. But four days later will be the biggest on their schedule as the Blue Devils travel to Georgetown as part of the Jersey Mike's Jamaica Classic for the first-ever meeting between the two programs. CCSU will then head to Montego Bay, Jamaica to play Austin Peay (Nov. 16) and Florida A&M (Nov. 18). The Blue Devils will also travel to Loyola Marymount (Nov. 21) as part of the event. In between the Jamaica Classic, CCSU will return to New Britain for its home opener against UMass-Lowell on Nov. 13. The second of the Blue Devils three home games in the non-conference slate will be against Pine Manor College on Nov. 25 with a trip to North Carolina A&T scheduled for four days later. 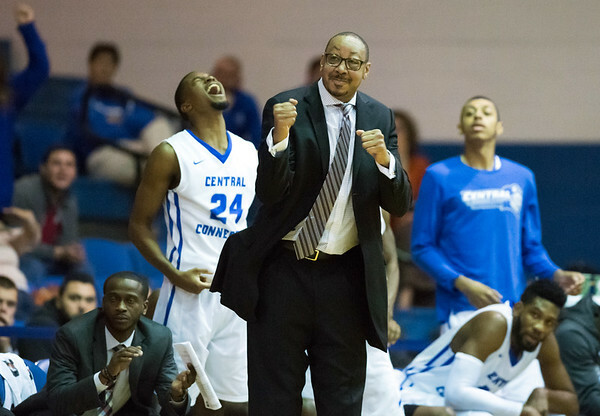 CCSU defeated the Aggies 72-59 in New Britain last season. The Blue Devils have another tough test in ACC-opponent Virginia Tech on Dec. 1. It will be another first-ever meeting for the men’s basketball program when it travels to Cassell Coliseum in Blacksburg, Virginia. CCSU will then host Penn State Wilkes-Barre at Detrick Gymnasium on Dec. 8. The team’s non-conference schedule will conclude with a trio of road contests at Providence (Dec. 16), Maine (Dec. 22) and Oregon State (Dec. 29) before beginning NEC play Jan. 3 against Wagner. Posted in The Bristol Press, CCSU on Tuesday, 11 September 2018 21:01. Updated: Tuesday, 11 September 2018 21:03.